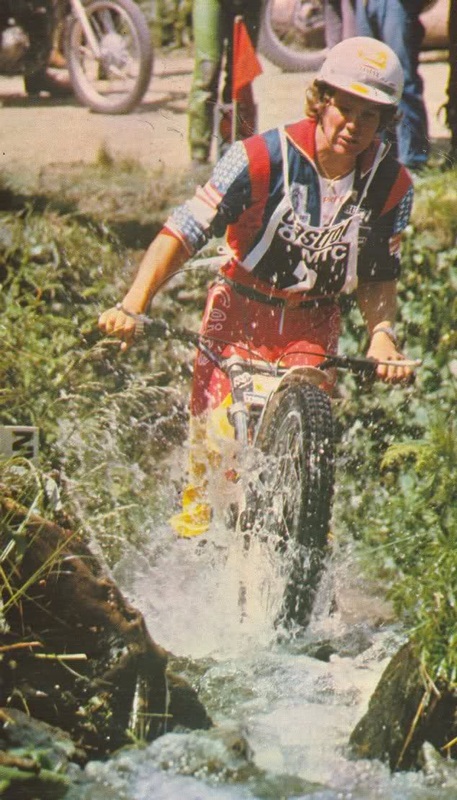 We're you still riding the US trials in the 70's? Yes I think I rode some events in the 1977 Championship but didn't win. In 78, I rode the Championship and did win. 1979 I don’t think so . I was going back and forth between Europe and the US. The roles were reversed back in the US and Marland Whalley won eight of the nine National Trials leaving Bernie in runner up position. ﻿For me it was nice to go back home. Every year I came back I was so much better than everyone else . It was like I was just riding in the US for fun. It was like an expo event. People just came to see me ride. There was no competition. Bernie wasnt sure about even returning back to Europe for 1978. He didnt speak the languages so couldnt converse .He also just didnt like relying on people for everything including lifts here and there. Bernie decided to go for it and returned to Europe. He fell on his feet when he became friendly with crew at Comerfords who were the Bultaco importers in the UK. Dave Renham who now runs In motion Bultaco Uk worked at Comerfords back then and remembers spending a lot of time with Bernie. Dave would gets afternoons off work ( Yipeeee !! ) to give Bernie a lift to a practise area so that he could keep and an eye on him , just in case something happened. Luckily , it rarely did. 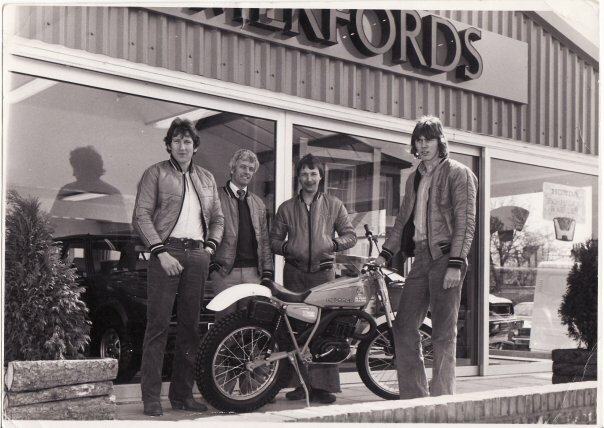 Thank you to Peter Hudson's for this photo of Pete and Colin Boniface standing together behind the Bultaco Sherpa in front of Comerfords. Also present is Peter Cartwright and Welsh rider Stuart Pearson. 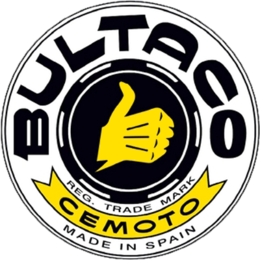 Today Comerfords Bultaco is nomore. The building has been demolished and is now replaced by Dagenham motors. This is the exact same location and view of the Bernie - riding over the barrel photo above. Yes, I think that was the only difficult section nearby Comerfords on the Thames there. We were riding on the side of the road. I think that construction was going on for years. Comerfords also had these two walls in a corner of the yard . I would practise hitting one wall and turning and then hitting the other wall and turning. I think Colin Boniface tried that once. Did they help you a lot? Yes they really did. They helped me with the bike and Reg May the mechanic. They were all great ,all of them. It was a big support. 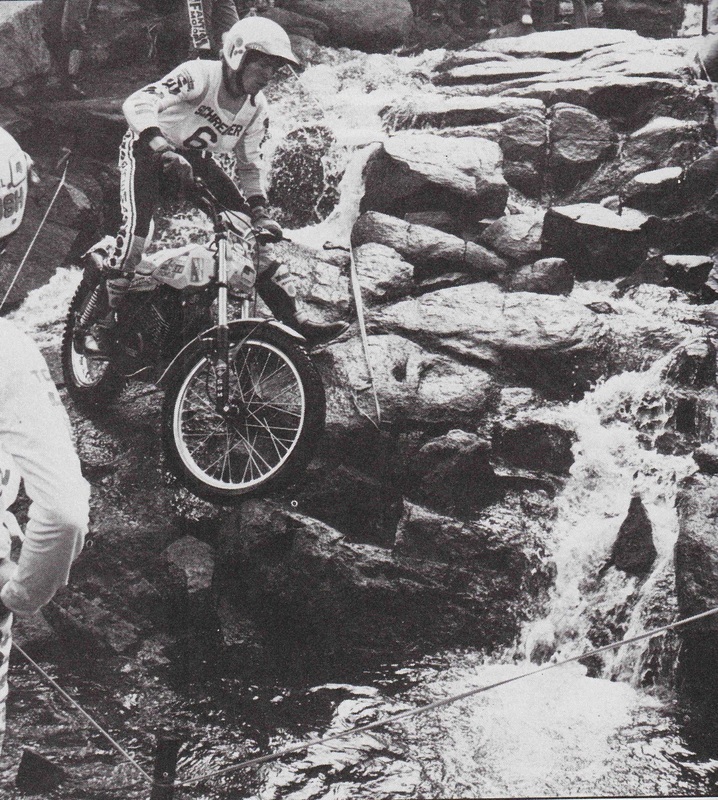 Despite a bad crash in France 1978 Bernie won his first World trial . This followed by 3 more wins in Spain , the US and Italy. Other excellent results throughout the year were hampered by a poor start to the season with a 9th in Ireland , an 8th in the Uk and a 15th place in Belgium. Needless to say , a 3rd overall place at the end of the year was significantly better than 7th in 77 . The boy was coming good. What other jobs had you had prior to trials? I did all kinds of stuff, mostly crazy stuff. I was working for friends in construction and we were building houses. I did insulation as well. I also did roofing in California. I did some other construction stuff mostly labour stuff. I also worked with my father at his machine shop and I helped to make basic tools. This is where I learnt things about parts and how things were made. Bit by bit. Pete's house was a real hang out for top riders back in the 70's and they would make their way there when they were in the UK. Vistors to Pete's include Manuel Soler , Eduardo Baldini , Danilo Galeazzi , Karlson, Vyjo Vesterinen and Colin Boniface. 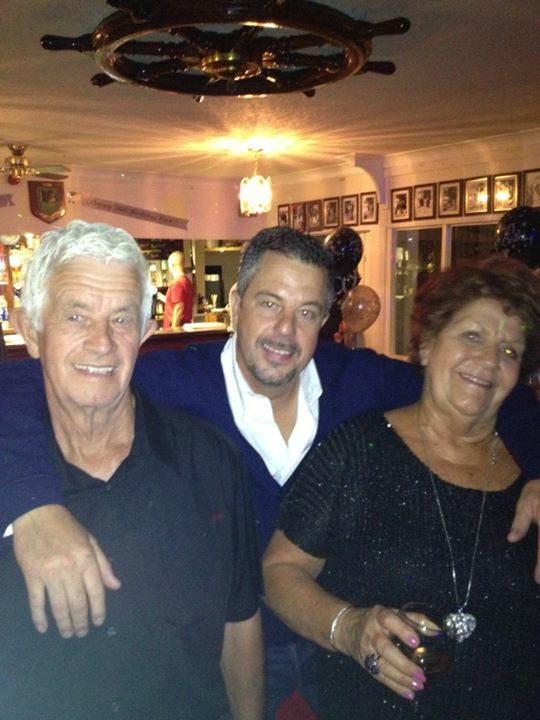 Peter to the left with wife Gill and the brave son Glenn who let Bernie bunny hop over him outside of the Spar shop. 2014 Bernie Schreiber Interview Thanks to the Hudsons for the photo. Peter started to ride when he was 17 and he was given a bike by a local dealer as he was pretty good on the pegs back then. In those days he says , you didn’t get paid , they just leant you a bike. Pete then got married and had children so gave the bike back as he had other commitments. Then, some time later he had a newsagents and post office in Roehampton. He ran this for a couple of years but he didn’t enjoy being shut up all day . The Post office didn’t suit him . Bert Thorne who recently passed away was the managing director of Comerfords. He made Peter a great offer . He told him that if he sold the Post Office ,he could come and work at Comerfords and run the Bultaco side of the business .It was big offer and Pete accepted. I remember this young lad of 17 came over to Comerford’s from America . He didn’t have anywhere to go and didn’t have anywhere to stay. He had come over with Marlon Whalley and Len weed to do the World Rounds. He was a bit upside down and didn’t know where he was going , so I took him home. My two boys just idolized him. He was like an older brother to them. Of course , Bernie would go off to the factory and then come back and we would go off in the van here there and everywhere. I would take Colin Boniface and Peter Cartwright as well ,to some of the rounds. I really just tried to keep Bernie's head on . Although he was a quiet boy off the bike , on the bike Bernie was flamboyant and would play to the crowd. He could do all of the tricks and he liked to show people that he could do them. Bernie was the first one to do the pivot turns , riding on the balls of his feet instead of the insteps and bunny hopping . When I saw him doing this ,I remember thinking , trials is on the change .This is really different. He got taught this from a bloke called Norm Sailer at a Ski lodge in Donner Pass in North California . He got a lot of influence from this guy . Bernie lived with us In West Byfleet for 2 years and of course became part of the family . Bernie just wanted to progress and progress, he’s a world Champion . That’s what World Champions do. Running with the World Champions all the time . Vesterinan, the Lampkins and of course Bernie was the most exciting time of my life . As well as being an importership ,Comerfords had a big retail side as well. Bert Thorne gave Peter lots of leeway on different projects that he wanted to do at work. These included running the business side on all of the Alpinestars boots , Regina chains and Yoki clothing ranges. Peter was a draughtsman by trade so would also draw up all of the pattern parts for the Bultaco and travel to Italy to have them made. Bert Thorne was very influential to Peter. 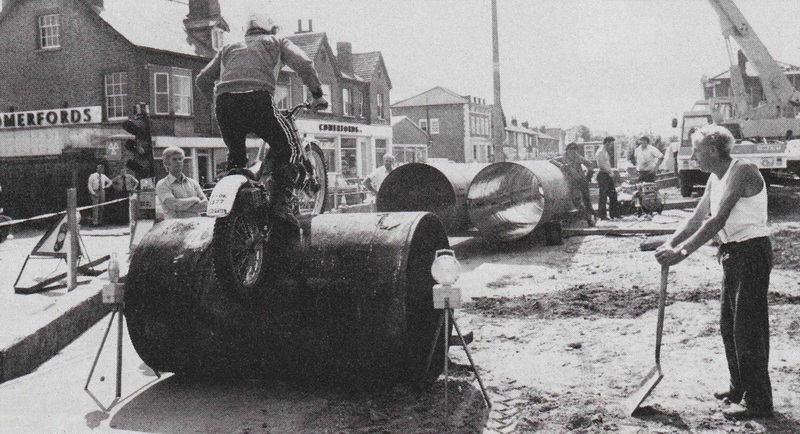 As well as taking the top riders practising to Donkey Woods ,Pete would often be present when they would go the Beamish test track in Small Dole. Although this is a motocross track set on a steep hillside there were some woods with some sections there. After the Bultaco days were passed , Italjet tried to rise out of the ashes. The initial Italjets were just painted green Bultaco’s . They were good bikes , however the new model that the company produced had problems. These problems included frames that didn’t flex , the carburation was placed too close to the exhaust ,the engines and gearboxes seized and the bike was too heavy .The company as a result of these problems self destructed. The UK importer was Martin Hardiman although non of the problems had anything to do with him.Peter had been the team manager at Comerfords looking after riders such as Vesterinen, Lampkin and Bernie.Reg May was head of the competition workshop for Bultaco and KTM. As a result of this great experience that Peter had , he was head hunted to run the competition teams at Italjet. But , he also had another possible option. Peter worked with Keith Thorpe who ran the workshop for the production side of Comerfords. He would deal with Warranty issues. 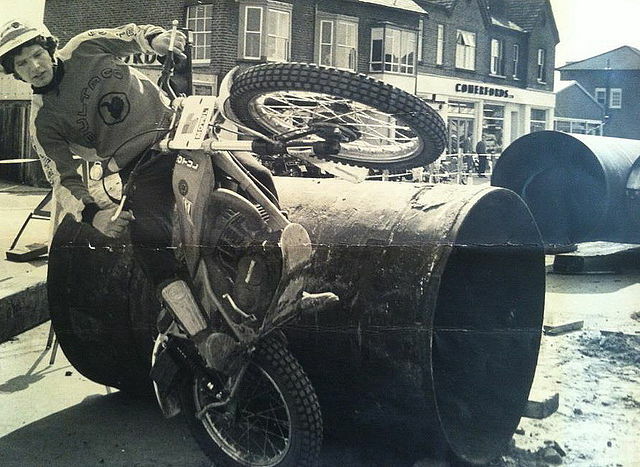 Keith was the father of World Champion motocrosser Dave Thorpe. Keith and Peter would often have lunch together and Keith mentioned that there was an opening for a competition manager at Honda and that peter should go for it. 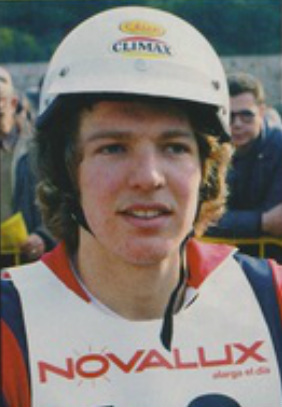 The team already managed Eddy Lejeune amongst other riders . Peter didn't follow up this option , but looking back thinks he should have. Decisions are always easy with the benefit of hindsight. 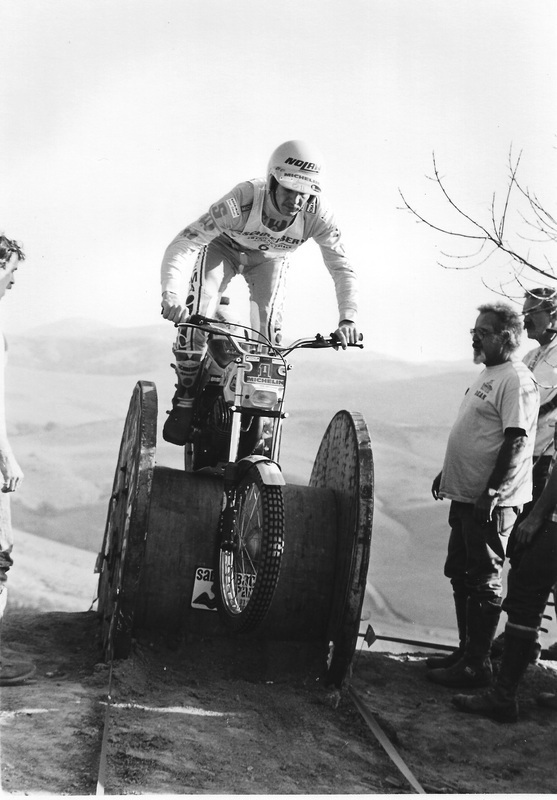 At this time Bernie was having success with the first prototype Italjet winning four World Trials at the start of 1980 . Peter's friendly acquaintance with Bernie and Bernie's success on the Italjet persuaded Peter to accept the offer from Italjet. Whilst these competitions went well , the production Italjet was a different story . Peter feels sure that if he had gone to Honda ,Bernie would have got a Honda biketo ride , but this is entirely hypothetical. After a while ,Peter left Italjet after a string of disappointments, just wanting to get out. Following this departure from Italjet Peter sold the house in West Byfleet and bought the Spar shop in Farnham. Bernie and Peter have always kept in very close contact with each other. Peter asked Bernie to come down to Byworth stores which was our shop . Pete says - "We got him to jump over the kids for some promotional photos for the papers. He did it easy". 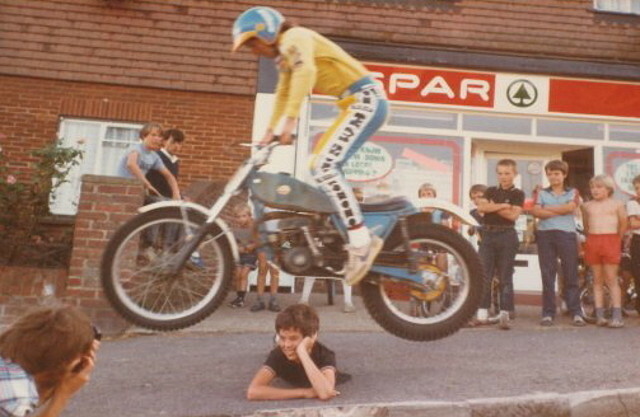 The photo of Bernie jumping my son shows Bernie on a Bultaco wearing SWM clothing. The Bultaco was Bernie World championship winning bike and I had kept it. He came along during his SWM days and jumped the kids, so that explains the SWM branded clothing. Later the shop was sold and converted to a dwelling .Peter and Gill moved out to Spain for 12 years and thoroughly enjoyed it but eventually returned to the UK. He is now retired and lives in Surrey with his wife Gillian. Peter - Do you have a copy of the one trick pony video ?. No I cant get it. I’ve tried everywhere to get it. It was a really good video. Id have a copy of that if you can get hold of it. Bernie wearing SWM trousers whilst bunny hopping Pete Hudson's son Glen on a Bultaco. Following the Pete Hudson's decision to leave Italjet he took ownership of a Spar shop in Surrey. Now i have spent hours and hours and hours trying to find this shop. It just kept nagging me , and i couldn't give up. I literally viewed every convenience store in West Surrey. Well, it paid off. Here is the shop today and its not even a store anymore !! . Its in Farnham,Surrey and has been converted into a dwelling. What was your favourite capacity of engine in your Bultaco? Was there anything particularly special about your bike back then? I remember Mr Bulto saying that the idea was not to make the product that the public couldn't buy. This was not the philosophy of us and any of the manufacturers, until the Japanese came in. The Spanish just wanted us to ride a production bike. You know everyone has their own little things. Martin never had enough power because he was big. Vesty always had something special. Coultard always had something small and special. Every rider had something special. What was special about your bike? To be honest I was not an engineer and I think I always wanted to try what the others were doing and trying so I could get my bike similar. I didn’t want to be left out in the cold without the best equipment. I wanted it to be right on a level playing field and then the best man wins. Just little things like foot pegs or little changes but not so much. I remember they were going to change and lengthen by one inch the exhaust pipe. I never understood what this did. We're you a good mechanic. We're you able to strip an engine down? I’d just work around the bike. I could take off the points and the fly wheel. Take them off and change the carburettor and change little things. Would Reg would do your engine work? Yes, more the specialty things. Did you ever go to Reg Mays house? He lives in a beautiful little cottage in Hambledon near Godalming? I think I might have done , yes. Did you have your own mechanic? We all had more of a team mechanic. We had someone who would prepare the bikes and say have a nice day and then somebody on site who would be there to help you know. ﻿You didn't have any minders to help out on the trial? No, the only noise you heard was the engine of the bike and the spectators clapping or telling you where to go. When you did well, did you ever get any congratulations from the factory or Paco? ﻿Did you feel pressure to win? At Bultaco, never. I never felt this. I think my only pressure came from anger and trying to improve. Did you spend a lot of time practising? You know, I have to say that I didn't spend as much time as some others like Vesterinan and other riders. I think that if I was disciplined and practised more I could have won several championships. I’m sure I could have. I wasn't focused. I didn't have my father in Europe talking to me and sitting me down after there every single event. I didn’t have my mother there to look after me or any really close family member. This would have been another level of management. I was lacking this at such a distance, but it creates other strengths. Do you wish that you'd had the SWM dentist as your manager early on in your career? For personal reasons I think yes, that would have been great. At that time I thought it was more an individual sport. It's become more like sports are today. Lejeune, Burgat. They had well off families supporting them. I didn't have so much support around me. I was enjoying my life and I was trying to make the best of what I had, do what you can, where you are, with what you have!. Did you like a drink? ﻿Were you a bitter or lager man? I didn't drink beer. That's probably why I got on better with Vesterenan and Karllson because they'd be on the vodka or whisky ha ha. It's funny as I don’t really drink alcohol at all and haven’t so for years and years. ﻿﻿Did your parents come over and watch you or not?